NELSON, New Zealand — An experimental All Blacks team was forced to dig deep Saturday to beat massive underdogs Argentina 46-24 in a Rugby Championship test at Trafalgar Park. Argentina, which hadn't beaten New Zealand in any of their 26 previous tests, scored the first try of both halves and played an unexpectedly potent attacking game to keep New Zealand under constant pressure. A disallowed try, a struggling scrum, a number of handling errors and a heavy penalty count finally thwarted the challenge of an Argentina team playing with confidence after beating South Africa in their most recent test. New Zealand held an unconvincing 18-14 lead after 50 minutes but a try-scoring double by scrumhalf T.J. Perenara and other tries to returning winger Nehe Milner-Skudder, captain Kieran Read, Shannon Frizell and Jack Goodhue allowed the All Blacks to escape and retain their unbeaten record in this year's Rugby Championship. For the Pumas, flyhalf Nicolas Sanchez scored a try and kicked three conversions and a penalty to overtake Felipe Contepomi (651 points) as the leading scorer for Argentina in tests. "(Argentina) really brought it to us today but we expected that," Read said. "There was probably a lot of effort out there from us but not that much accuracy ... We went wide too early and didn't quite respect the ball enough." Argentina signaled its intention from the outset, running onto the ball at pace and rocking the All Blacks with the first try of the match after 15 minutes to winger Ramiro Moyano. Milner-Skudder missed his defensive assignment on his opposite number and Moyano launched a weaving, inside-outside run, beating Perenara and flyhalf Richie Mo'unga on his way to the line. New Zealand reclaimed the lead with a try to Milner-Skudder, playing his first test since October after injuries, who finished wide out after a line break by young flanker Frizell. The ball-carrying by Frizell, who was among New Zealand's best players, and by other forwards such as Scott Barrett and Codie Taylor was the best part of an otherwise disjointed All Blacks performance. The New Zealand team featured nine changes — eight of personnel and one positional — from the one which beat Australia 40-12 in the previous round of the Championship. The new combination didn't work and became more fragile when the All Blacks lost two key players — lock Brodie Retallick and center Ngani Laumape — to injuries around the ninth minute, forcing them to plunder their bench earlier than intended. 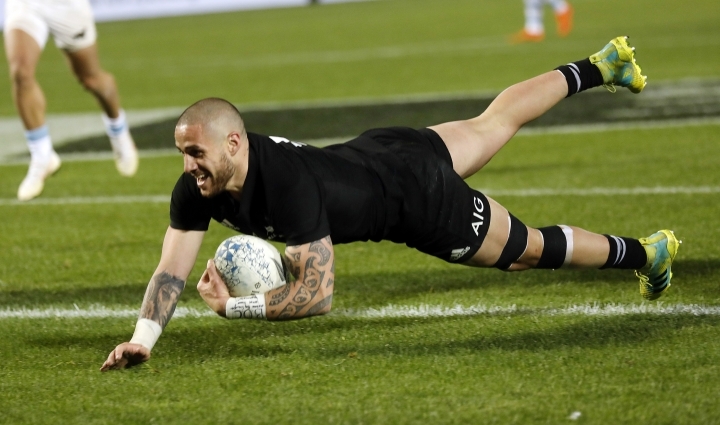 Perenara scored his first try in the 29th minute after a long period of pressure on the Pumas' line and soon after made a try-saving tackle on Matias Moroni that was important to the outcome of the test, allowing the All Blacks to go to halftime with an 18-7 lead. Sanchez sent Moroni away on a dash down the right touchline and Perenara scampered across to make a tackle in the corner. After a long consultation the referees decided Moroni had put a foot in touch. Argentina again scored first in the second half with Sanchez dashing through a gap between forwards Owen Franks and Taylor after steady pressure on the All Blacks line. 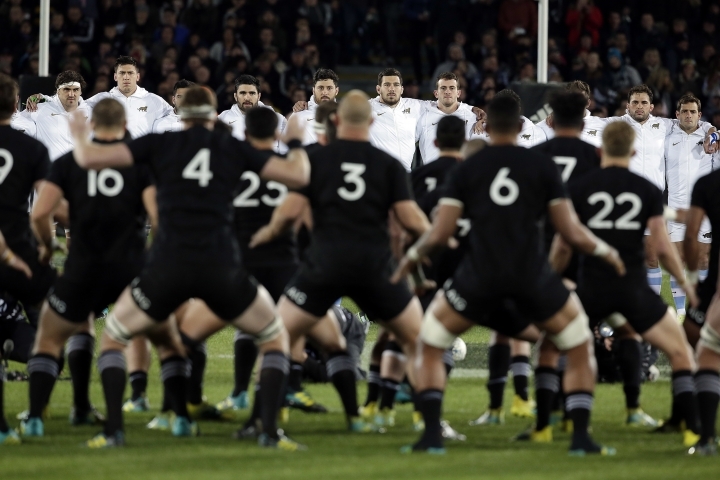 At 18-14 Read called the All Blacks together for a pep talk. Read led the fightback with a try of his own in the 49th which helped to make the game safe. Sanchez reduced the margin with a penalty which took him past Contepomi's scoring milestone. Perenara's second try gave the All Blacks a 32-17 lead but the Pumas hit back again with a try to fullback Emiliano Boffelli off a short pass from Sanchez. The All Blacks finished strongly with late tries to Frizell and Goodhue. Mo'unga, starting a test for the first time, had a mixed performance, missing his first kick at touch from a penalty and recording an early handling error and missed tackle in Moyano's try. But he finished with five conversions and two penalties for 16 points. 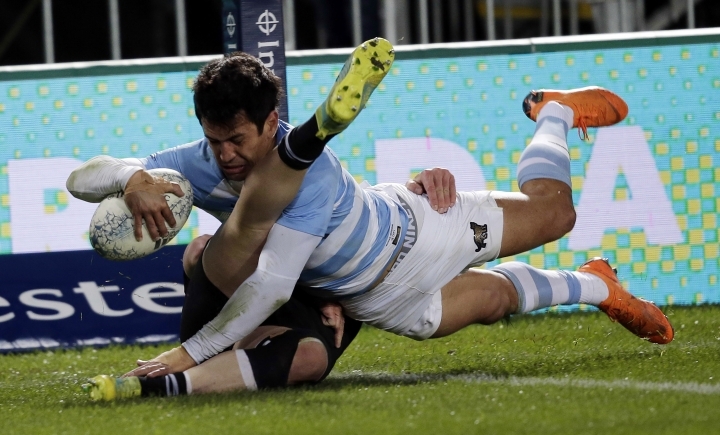 "I think it was a really good game for us but we need to improve in our scrum which I think is the problem," Argentina captain Agustin Creevy said. "The first half was really, really fast and I think we had a problem with that. But we feel good, we feel strong and we need to continue."